In pvPlanner, photovoltaic electricity production is simulated by numerical models developed and implemented by the Solargis Company. The aggregated data based on 15-minute time series of solar radiation and air temperature are used on the input. The data and model quality is controlled according to recommendation of IEA SHC Task 36 and EU FP6 project MESoR standards. The scheme bellow shows a simplified description of pvPlanner algorithms in action. 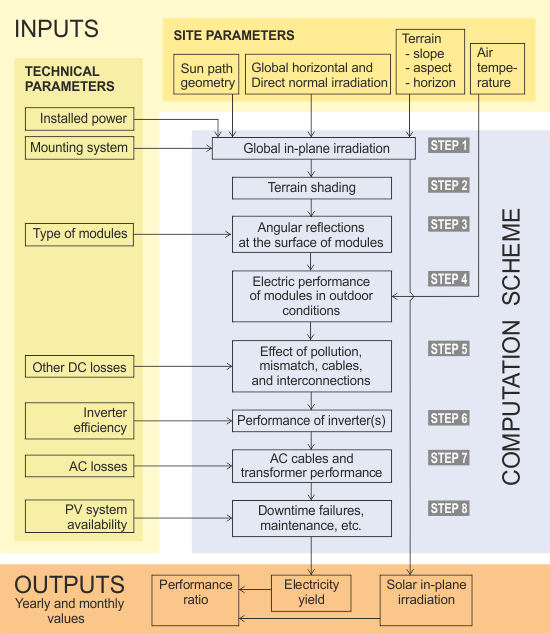 The COMPUTATION process consists of 8 main steps (see the scheme below). When finished, the Solargis server sends the OUTPUT to the client's browser to in the form of tables and graphs. More detailed description of the methods implemented in Solargis pvPlanner are presented in this PDF document (2.0 MB).